Putin@war: Ukrainian army is NOT in control of Slovyansk at all. Ukrainian army is NOT in control of Slovyansk at all. This is the current situation in Slovyansk. The Ukrainian Army has checkpoints around the city. But on the Eastern side the rebels have a huge stronghold and therefore they are NOT surrounded, nor cut off. Through the Eastern route they have been and are able to send in supplies, people, ammunition as well as AT or air defense systems. Since the 18th they are attacking the tv-tower and the southern checkpoint, probably in attempts to connect their lines with Kramatorsk, which is also still in control of the rebels. For the attack on the tv tower look here 19-5 and here 20-5. 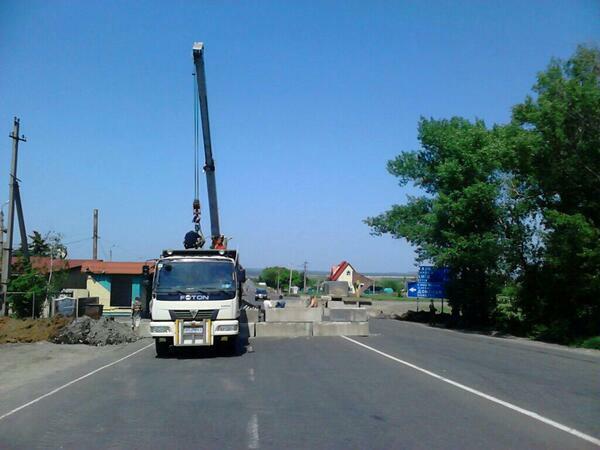 For the attack on the southern checkpoint between Kramatorsk and Slovyansk look here. Since the beginning of ATO, they took the tv-tower, the bridge in Andriivka and the crossing with the railway station. They lost control over the crossing since wagons had been placed there. They lost control over the bridge and now the tv-tower is under constant attack.